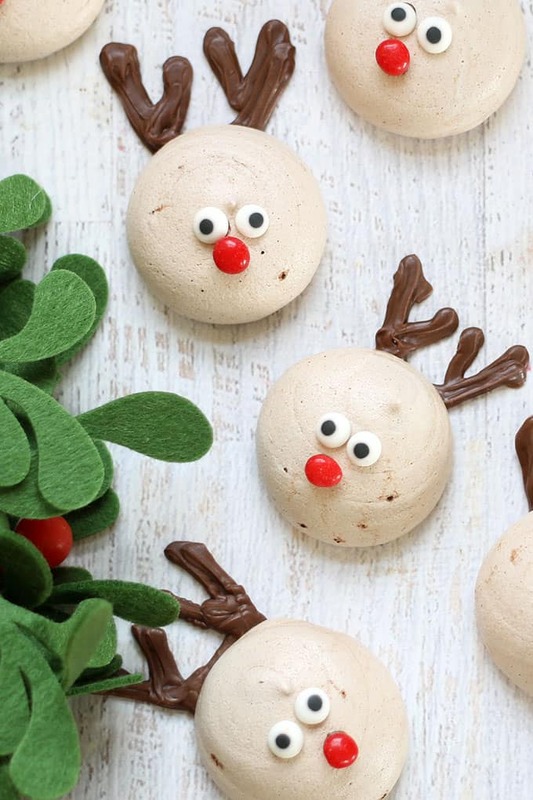 peppermint chocolate reindeer meringue cookies are Christmas in two bites. Maybe three. 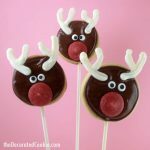 Oh the heavenly combination of Rudolph, peppermint, chocolate and sugar. 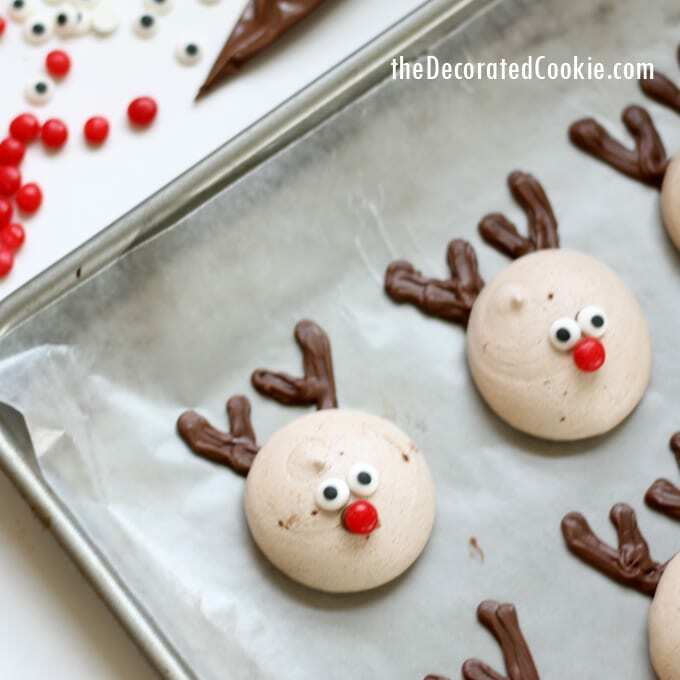 That’s what magically merges to make these peppermint chocolate reindeer meringue cookies (or Rudolph meringue cookies). I just love them so very very much. And the making and decorating part goes quickly. The cooking part is a bit long (two to four hours). 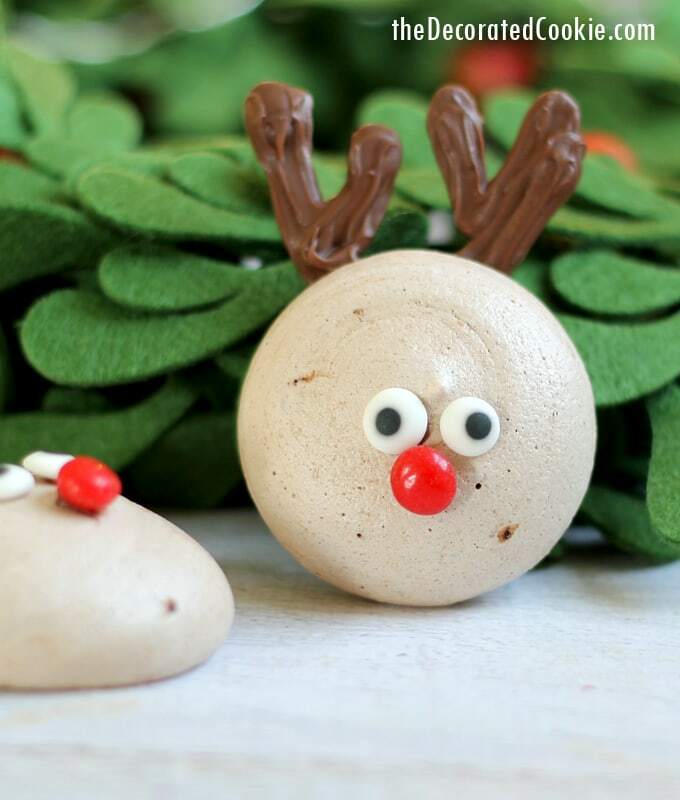 But you can do the meringue cookie part one day and the antler, eyes and nose part the next day. And they are just the cutest. And the peppermint chocolate flavors are exactly right. And the airy meringue melts in your mouth. And so simple and easy to make. Just look at this guy. He’s so ready for your cookie tray. *Find the decorating bags, tip, candy melts, red candies and candy eyes in the craft store, or see below for supplies. Preheat the oven to 200 degrees F. Line a couple baking trays with parchment paper and set aside. Place the egg whites in the bowl of a standing mixer fitted with a wire whip, or in a large bowl if you are using a electric hand mixer. Add the peppermint extract and cream of tartar. Whip at high speed until the mixture looks like snow with stiff peaks. Gradually add the sugar while mixing at medium speed. Switch to high speed until the mixture begins to shine. Stir in the cocoa powder at low speed. 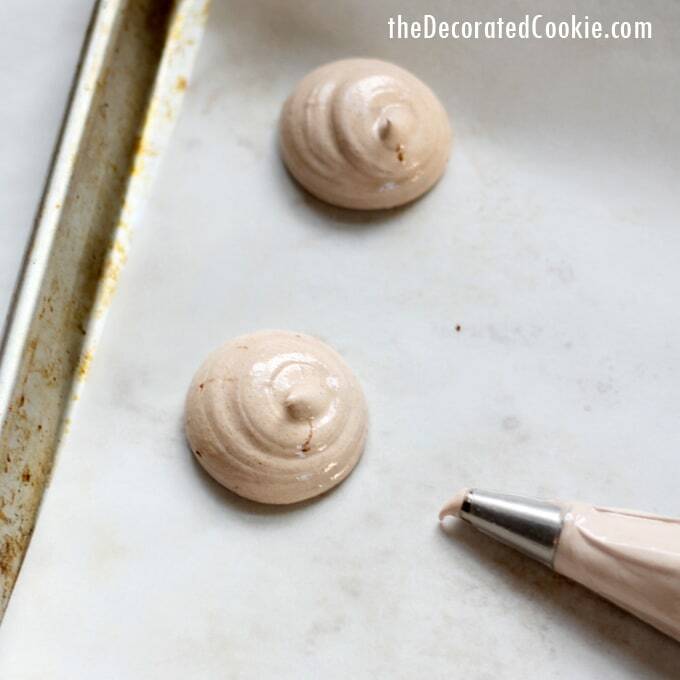 Assemble a decorating bag with the size 12 tip and fill with the meringue. Pipe balls on the tray about 2-inches across and an inch apart. To pipe a ball, just hold the decorating bag vertically and squeeze. Fill the baking trays, refilling the decorating bag as needed. You’ll have between 28 and 30 meringues. Bake for 2 hours or until the meringue sets but doesn’t yet begin to brown. Turn off the oven, open the door slightly and let the meringues sit in the warm oven for 2 more hours. Let cool. Line two baking trays with wax paper. 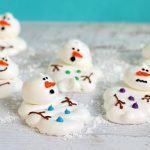 Fill a disposable decorating bag with chocolate chips or candy melts. Microwave for 90 seconds at 70 percent power. Massage the bag and continue to microwave at 30 second, then 15 second, intervals until the chocolate is fully melted. Snip 1/4-inch from the tip of the bag. 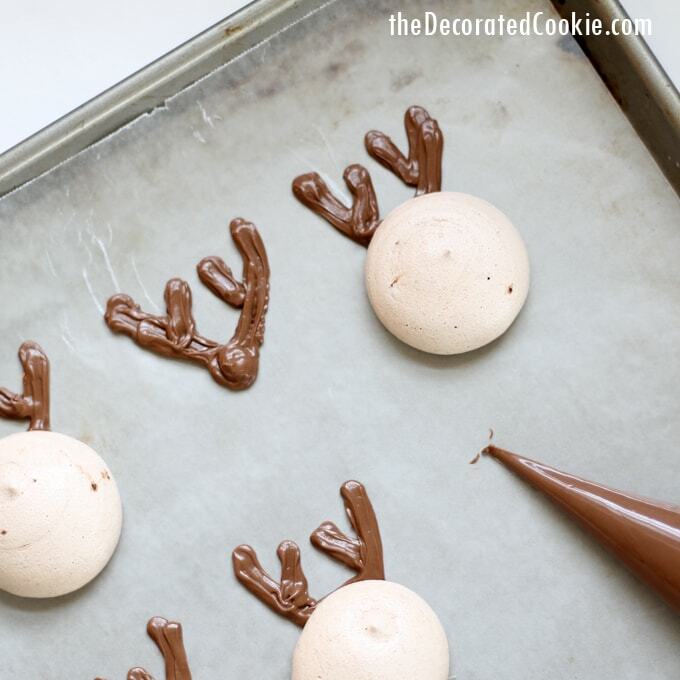 Pipe antlers on the baking tray and immediately place a meringue cookie on top. 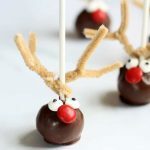 Make sure to leave a good dollop of chocolate at the end of the antlers so it sticks well to the back of the meringue. 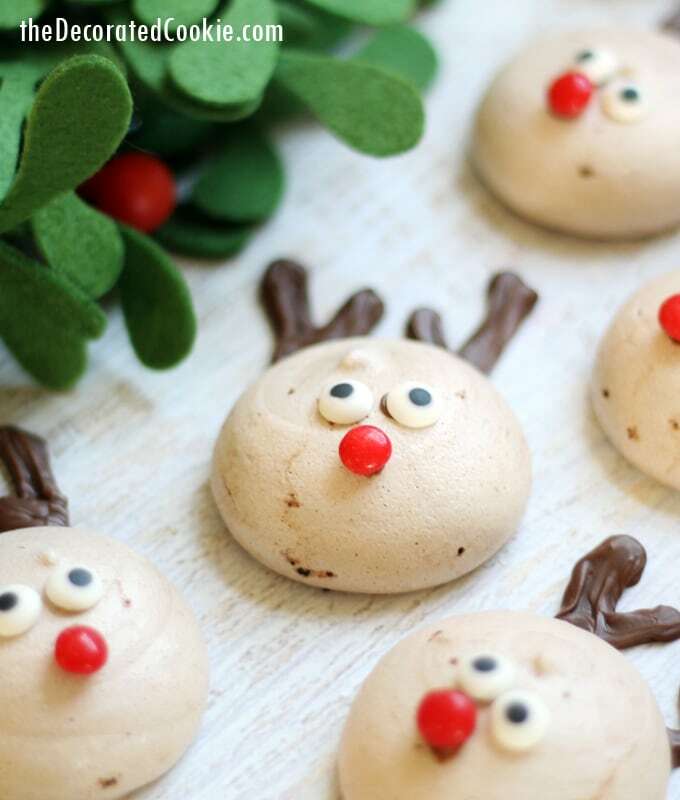 Fill the trays with reindeer. 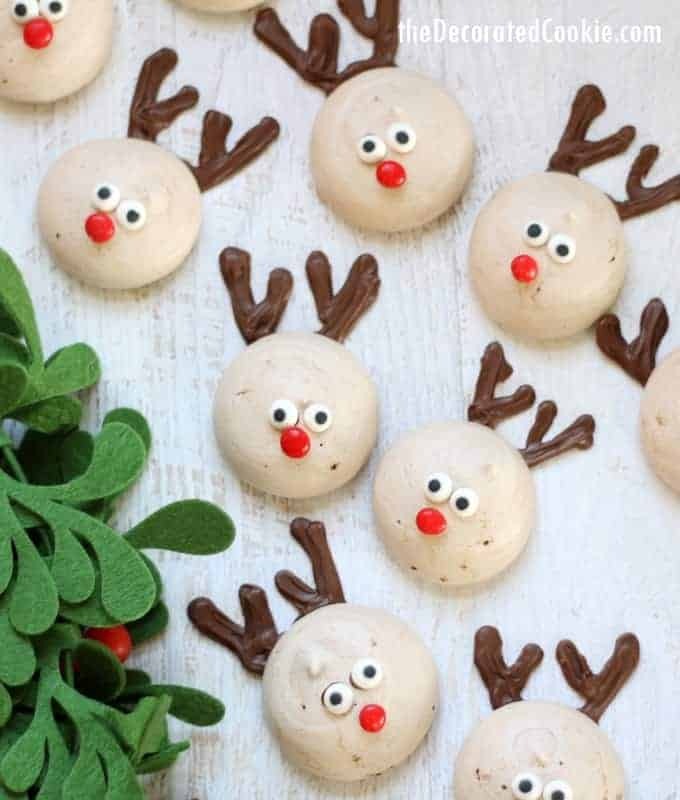 Use small dots of melted candy melts to adhere the candy eyes and red noses. Let set at least an hour before carefully removing from the baking tray. If the chocolate starts to harden, microwave for 15 seconds more. Place the egg whites in the bowl of a standing mixer fitted with a wire whip, or in a large bowl if you are using a electric hand mixer. Add the peppermint extract and cream of tartar. Whip at high speed until the mixture looks like snow with stiff peaks. Gradually add the sugar while mixing at medium speed. Switch to high speed until the mixture begins to shine. Add the cocoa powder and stir in at low speed. Assemble a decorating bag with the size 12 tip and fill with the meringue. Pipe balls on the tray about 2-inches across and an inch apart. To pipe a ball, just hold the decorating bag vertically and squeeze. Fill the baking trays, refilling the decorating bag as needed. You'll have between 28 and 30 meringues. Bake for 2 hours or until the meringue sets but doesn't yet begin to brown. Turn off the oven, open the door slightly and let the meringues sit in the warm oven for 2 more hours. Let cool. Note below: I included the Betty Crocker Cinnamon Imperials so you can see what they look like. You should find these in the supermarket, and it’s what I used here. Below is a pack of six because it’s all I could find on amazon. Please don’t accidentally buy a pack of six. I can’t fathom how anyone would need that many in a lifetime. I agree, these are the cutest 🙂 Great idea! 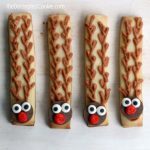 I love the chocolate antlers.